My first cookbook by a major publisher, Maangchi’s Real Korean Cooking came out in 2015 and is available worldwide wherever books are sold. It was chosen as one one of Amazon’s 100 best cookbooks of all time and is also the #1 Korean cookbook worldwide. 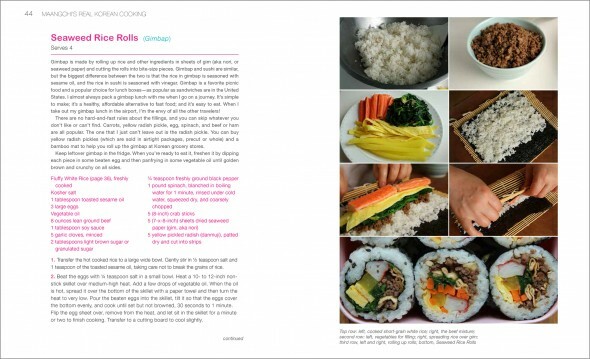 In 2018 it was translated into German and remains Amazon’s top Korean cookbook. This is my first cookbook with a major publisher (Houghton Mifflin Harcourt) and we worked very hard to make a comprehensive, wide-angle view of Korean cooking, from the simplest recipes to the most advanced (see the full recipe index, in English, Korean, and Romanized Korean). 125 recipes over 300 pages, with more than 400 of my photos, with the best, most popular recipes from my website, reworked and rewritten with 75 new ones never before seen, some rarely or never published in English, anywhere. It took more than 2 years to make! The book focuses on traditional-style and authentic Korean dishes. There are recipes for essential Korean dishes and also for lesser-known ones everyone should know. Some have never before been published in English. I wrote a whole chapter on Korean fermentation, and a big big chapter full of side dishes (banchan) that you’ll come back to again and again for delicious meal ideas. The quickest side dishes take 2 minutes to make, and the longest dishes take a year. 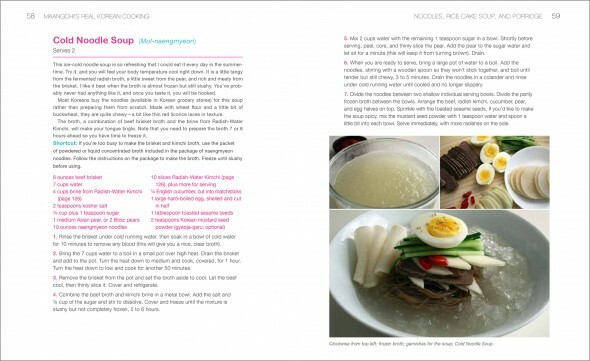 There’s also a lot of info on Korean food culture, ingredients, useful substitutions, tips & tricks & shortcuts. Plus my own life stories about cooking and Korean culture, and even some reprinted comments & advice from my readers! All recipes are delicious and I guarantee you’ll love all of them. For a few years, I put all my energy and effort into making the best of best Korean cookbook for you, and I hope you enjoy it! “Maangchi is an amazing source for authentic Korean recipes that are easily and thoroughly explained for professional and amateur cooks alike. Her passion for Korean food and her pursuit of culinary excellence have inspired me and many others."